I should start this off by admitting that I was, and remain, a huge fan of British New Wave…or Post-Punk…or whatever you want to label music from 1979-1983 that includes artists like xtc, Magazine, Teardrop Explodes, Psych Furs, Thomas Dolby, Lene Lovich, The The, etc. As a result, I harbor a soft spot (if not an actual affinity) for the synth-pop bands that came right after …such as Ultravox, Human League, ABC, and, yes…even Duran Duran (well, their first album anyway). 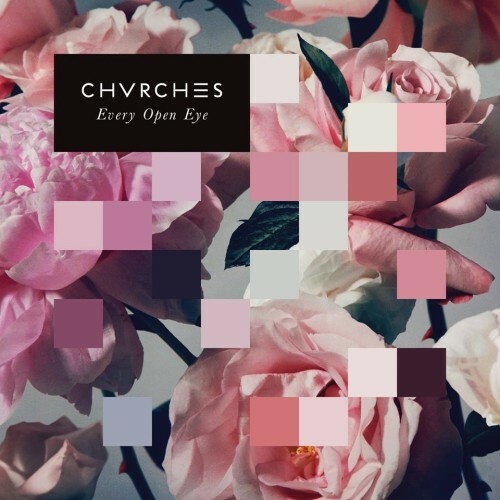 So when a friend of mine suggested, last year, that I listen to a Scottish band called Chvrches (spelled with a V, and not to be confused with another fave of mine, The Church), by telling me they were right up my exceedingly aged alley, I was highly skeptical. They were, to me, exciting and smart. And, beyond that, I loved the idea that the entire album made sense and was carefully sequenced…not just two singles surrounded by some other stuff. Those of us who straddle Baby-Boomer and Gen X status were fortunate enough to live in an era, before Spotify and Rhapsody, when it was the album…not the single…that mattered. You got a record, sat down and listened to the whole thing…over and over…even silly pop albums. “Bones” is, to me anyway, a great album. An album both of its time and well before. So, obviously, I couldn’t have been more excited for “Every Open Eye” to be released. There are so few young pop bands I enjoy. There seems to be a lot of crap out there now. This was probably true back in ’79-84 as well, but I knew how to swim the waters back then. Not so much now. “Never Ending Circles”: Not bad, kinda Kate Bush…kinda. “Leave a Trace”: Infectious pop, but in the Ariana Grande sense. The hook works, but for all the wrong reasons. “Keep You on My Side”: Ultravox. Pure and simple. Which I can listen to whenever I want. “Make Them Gold”: Taylor Swift-esque anthem created with “Europa and The Pirate Twins”-era Dolby production. So half bad, half good. “Clearest Blue”: The strongest song on the record, for me. This Yaz-influenced beat-heavy cut is most reminiscent of what made the first record so strong in the first place. Except maybe the straight ABC lift midway through, which, gratefully, leads to a wonderful bridge. I really dig this tune. It illustrates what this record could’ve been and gives me hope they will succeed again in the future. “High Enough to Carry You Over”: I can’t…I don’t…I mean…it’s a cross between Human League, Hall and Oates and 90’s-era Glenn Frey. Oh, with a Daft Punk bridge. No, really. Click here if you don’t believe me. Listen, it takes work to do that. Alas, not good work. “Empty Threat”: Also just a terrible, terrible song. It’s the kind of song you’d hear as a montage during the “we can do it” part of a show on ABC Family. But…it IS very well produced. So there’s that. Oy. “Playing Dead”: Infectious. Bland. And extremely Human League. “Bury It”: “Whip It”-era Devo opening…and it’s all downhill from there. Redundant. “Afterglow”: THIS IS THE SONG! Well, more of an idea than a song. An obvious homage to an earlier Scottish trio, The Blue Nile. The prettiest and most successful thing on the record. On the Special Edition version of the album, there are three bonus tracks. One of them, “Bow Down”, is excellent and should’ve made the initial cut. Huh. Maybe it’s a bad record, after all. Two songs, “Clearest Blue” and “Afterglow,” are worth downloading. The rest? Ah well. Let’s hope this album is just a sophomore slump, because I’d hate to think they’re merely a one-record wonder.